Taiwanese-Canadian harpist Joy Yeh serves as a faculty member at Kwantlen Polytechnic University, Director-at-Large of the American Harp Society BC Chapter, Co-Head of the Harp Department at the Vancouver Academy of Music and the Co-Scholarship Chair of the Vancouver Women’s Musical Society. She obtains her doctoral candidacy from the Indiana University, a master degree from Yale University and a bachelor degree from UBC. She began her harp training at the age of 4 and has been a pupil of Susann McDonald, June Han, Rita Costanzi, Elizabeth Bligh, Li-Ching Chen, and Chia-Ho Lee. 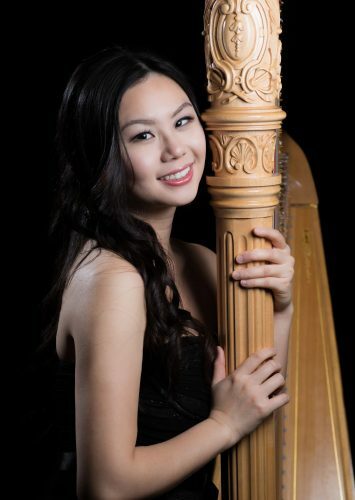 A recipient of many scholarships and awards, Ms. Yeh was awarded the Canada Arts Council Grant for professional musician, twice by the British Columbia Arts Council and the Grand Prize winner of the Vancouver Women’s Musical Society Scholarship Competition, the UBC Concerto Competition, and First Place of the Burnaby Clef Concerto Competition, in which Ms. Yeh was the only time a harpist was chosen as 1st Prize Winner in the Burnaby Clef Society’s 25 year history. She has been featured numerous times as a soloist with the Vancouver Symphony Orchestra and the UBC Symphony Orchestra and has performed solo and ensemble work in music concert halls such as the Carnegie Hall in New York, Konzerthaus Berlin, the Orpheum and the Chan Centre for Performance Arts in Vancouver. Ms. Yeh’s harp “resounded with sparkling clarity” (Georgia Straight). Her invitations include solo appearance in the World Harp Congress in Canada and personal interviews from several local television shows, radio programs and magazines in Vancouver. As an avid artist for Canadian Music, she has recorded and performed pieces by renowned Canadian composers and her recording has been broadcasted over CBC. Periodically, she is committed to different music institutes and international concert series to perform solo recitals. Ms. Yeh plays frequently with the Vancouver Symphony Orchestra and the Bellingham Music Festival Orchestra in the US. She also performed with the Vancouver Opera Orchestra, Victoria Symphony Orchestra, Prince George Symphony Orchestra, Vancouver Philharmonic Orchestra, Vancouver Inter-Cultural Orchestra, Vancouver Metropolitan Orchestra and the Vancouver Oratorio Society. She has had students from different countries to study with her, including Hong Kong, Malaysia, Singapore, USA, and France, also has given masterclass at Prince George Conservatory of Music. Her students are well-connected and active in performing with the Vancouver Bach Choir, Vancouver Metropolitan Orchestra, the Sunshine Coast Symphony Orchestra and at competitions/examinations such as the Kiwanis Music Festival, the Elsje de Ridder Armstrong Chamber Music Competition, the Edith Lando Gifted Youth Scholarship Competition and the RCM Examinations. Many have been recognized with honors and awards.